I’m baking one of my favorite biscuits for my monthly series, Portland Plates, where I recreate popular Portland dishes. For one glorious year I lived in a little apartment on 24th & East Burnside and I loved it. Ok, I’m sugar coating it a lot, the apartment was a total piece of crap, complete with terrible brown shag carpets and a horrible ant problem, but the neighborhood was fantastic. We were young, in our early/mid 20’s and went out a lot so it was perfect. Movies at the Laurelhurst Theater, happy hour at Pambiche, fish bowls at the original Happy Tiger (who remembers that place? Such a dump!) and cheddar corn biscuits at Crema. Crema on SE 28th & Ankeny has been churning out amazing pastries and coffee for years, but my favorite thing is always their biscuits. These aren’t exactly traditional biscuits, kind of a scone/biscuit hybrid, but I LOVE them. The make a mushroom manchego variety, which is excellent but my favorite has always been (and always will be) cheddar corn. 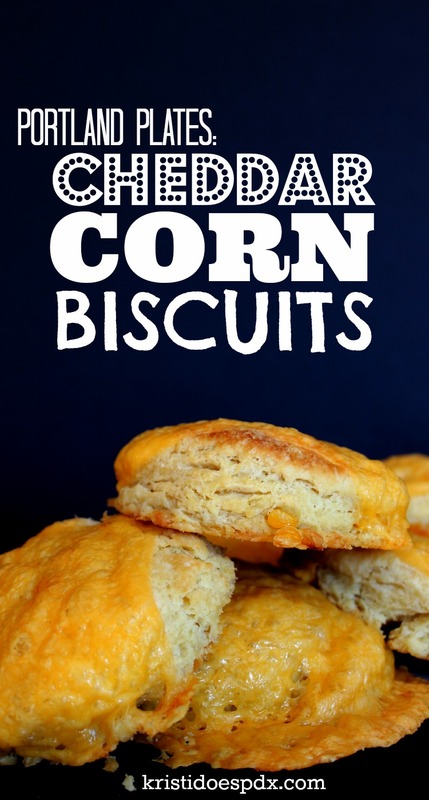 Tender dough with toasted corn kernels and a generous amount of cheddar cheese. This was a tough one to recreate. I tried three different recipes I found online, none seemed quite right. So I went back to do a taste test (anything for my art) revised my plan and came up with this, using the biscuit base from a Joy The Baker recipe. It’s still not an exact match, but it’s pretty darn close and it is absolutely delicious. These are great for breakfast with coffee, or do what we’re doing, turning them into ham sandwiches for lunch. Give them a try in your kitchen, then be sure to go check out the real thing at Crema. 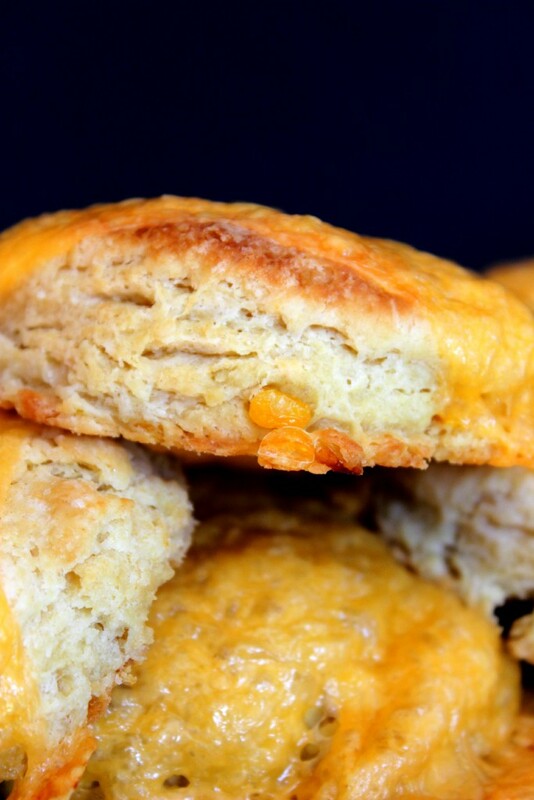 Tender biscuits with roasted corn and a cheese topping. In a large skillet over high heat, toast corn kernels until lightly browned. Set aside to cool. Place rack in upper third of the oven then heat the oven to 400 degrees F. Line a baking sheet with parchment paper and set aside. In a large mixing bowl, stir together flour, sugar, baking powder, baking soda and salt. Cut in butter using a pastry cutter or your fingers, until the mixture resembles a coarse meal. The butter should be the size of oat flakes or small peas. In a small bowl, combine egg and buttermilk. Beat lightly with a fork. Create a well at the center of the flour mix, add the toasted corn and egg mixture. Stir into a shaggy mixture. Turn the dough out onto a lightly floured board and pat into a 1/2-inch thick circle. Use a biscuit cutter to cut biscuits then press remaining dough together to create more biscuits. 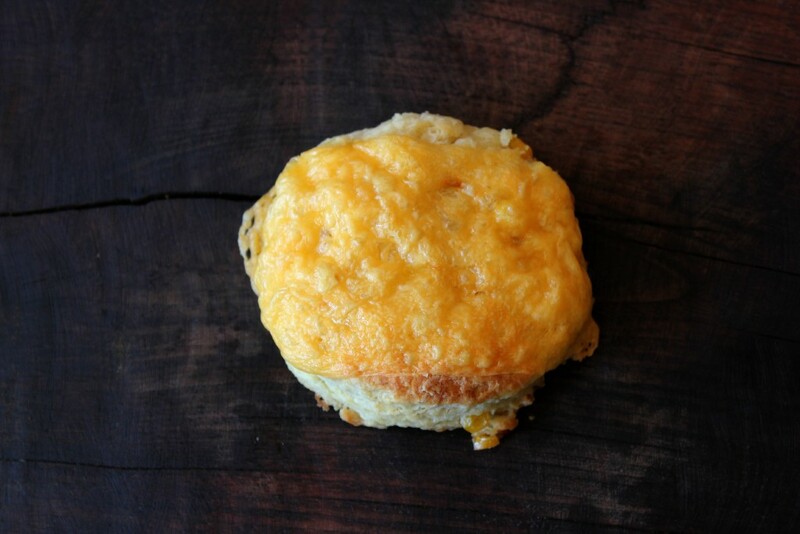 Place biscuits onto prepared baking sheet and top each with a slice of cheddar cheese. Chill in the refrigerator for 15 minutes then bake for 15-20 until cheese is melted and starting to brown. 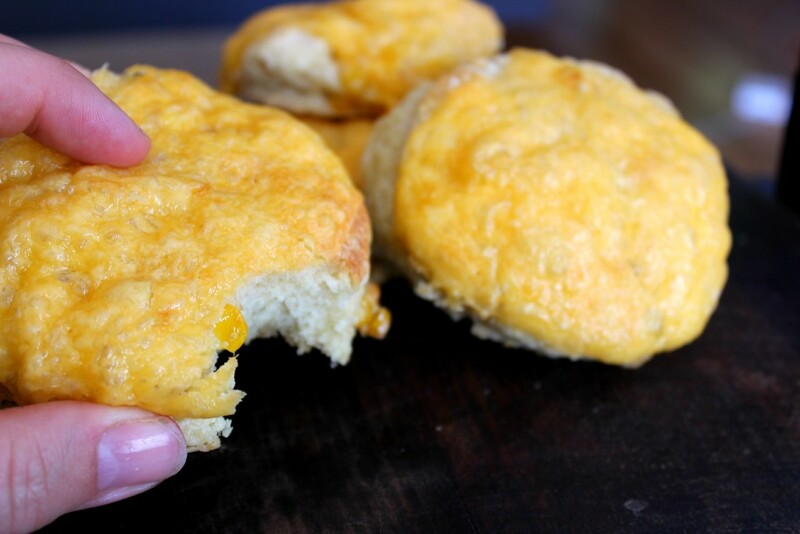 Biscuits are best the day they are made, but can also be frozen and reheated.